… Literally, like on the presentation wall of what seemed like the longest Amazon Press Event in Amazon Press Event history. For those keeping track at home, Amazon CEO Jeff Bezos continued his one man attack on the print publishing industry with the announcements of the Kindle Paperwhite, new Kindle Fire, new Kindle Fire HD and an updated Kindle — Four new e-reading-focused services gadgets in total, without counting the Wifi or 3G+Wifi versions. While in traditional Bezos fashion, the graph doesn’t actually have any numbers on its Y axis (:/) — it seems to be chronicling the hockey stick growth of all Kindle Books sold through Amazon, versus the linear growth of physical books sold through the platform. 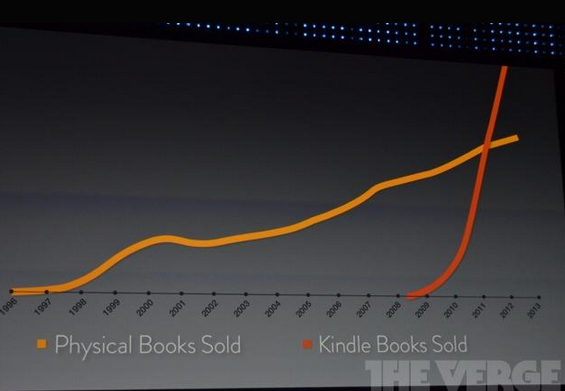 Kindle book sales surpassed hardcover sales in 2010 and surpassed physical book sales in 2011. Here’s the same curve at an Amazon conference a year ago. Bezos seems to really like this slide. Even though we all probably still have modest looking print libraries, looking at these, granted very vague, graphs, I can’t picture a future where physical books aren’t collectors items — nostalgic artifacts like records or typewriters.